Rotates every molecule on the canvas in 3D. Clicking on the canvas results that the molecule starts rotating automatically in 3D. You can stop the rotating by clicking again. If you want to rotate the molecules in 3D manually, drag with the mouse pointer on the canvas. While rotating, you can see the current angle of rotation around the and horizontal (x-) axis next to the cursor, as well as on the two axis at the edges of the canvas. 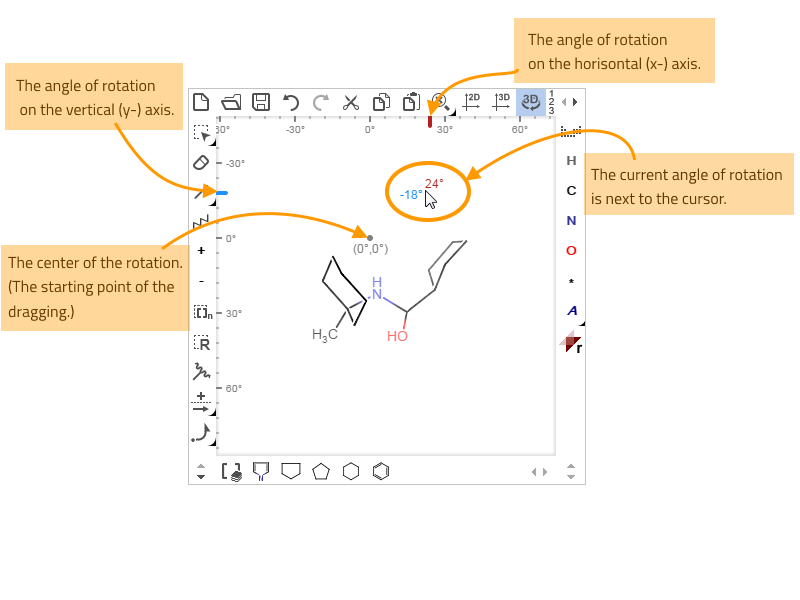 If you hold down the Shift key while rotating, you can rotate the structure around the vertical or horizontal axis only, depending on the main direction of dragging (i.e., if you move the cursor from left to right, the structure will be rotated around the y-axis, while if you drag the cursor up and down, the molecules will be rotated around the x-axis).